Perhaps because millions of baby boomers are hitting their “senior citizen” ages, we are seeing an increase in statements by doctors, websites, and pharmaceutical reps implying that seniors should not have T3 in their treatment like NDT (Natural Desiccated Thyroid) or synthetic T3, calling it “dangerous”. So I hope you are as impressed with the words below of this wonderful 72-year-old lady named Pat as I was…because her experience refutes the growing and ridiculous fallacy that T3 is globally and inherently “dangerous”. During all this time, I was diagnosed with multiple problems (which are typical for too many people on the poor treatment with T4-only or those undiagnosed): fibromyalgia, high cholesterol, high blood pressure, arthritis in my fingers, fatty liver syndrome and more. I also had the inflammatory disease called sarcoidosis in one nerve and in my lungs. I can’t actually connect sarcoidosis to my hypothyroidism and poor treatment with Synthroid, even if hypo people can report seeing increased inflammation. But it did happen when I was taking Synthroid. I had to take prednisone to beat it back and have been in remission for 15 years now. But the bottom line is that for all those other issues mentioned above, I used to take multiple medications to treat all of them. And guess what? Changing to Natural Desiccated Thyroid (NDT) four years ago took away all the above issues I was having, meaning I was also able to get off most of my prescription meds. I have less fatigue. I now have the flexibility of a 40 year old. The arthritis I had in my fingers just went away. I don’t need cholesterol or blood pressure meds anymore. I sometimes add in compounded T3 if my RT3 (reverse T3) inches up. My latest doctor now takes Natural Desiccated Thyroid after she saw how well I was doing. She has hypothyroidism and Hashimoto’s. We share a lot of ideas on how to conquer this disease. My husband often goes to my appointments and says he does not understand a thing we discuss. I gave my doctor my copy of the “Stop The Thyroid Madness” book. Interestingly enough, i knew when I went to my doctor that she used to recommend Synthroid, but also recommended herbs and other things to help with this disease. She was open to change, I think, because of her own experience. So I think I blew their office up on my first appointment. I came in with all my labs and history. It was a 3-hour appointment with 2 people plugging in my info – my doctor and her assistant. It was later that I realized, when she asked me how I took my NDT, that she had switched to an NDT herself! On our last appointment when we were talking about my slowly rising antibodies she told me that hers were in the thousands (my mouth dropped) and that she was taking 6 grains of her NDT. I’m thinking of recommending that she take LDN (low dose naltrexone) as I have heard it can reduce the antibodies. 1) Medicare in the United States dropped all NDT’s from their Part D formulary—i.e. they won’t be paid for if you rely on Medicare. Armour on page 2, Naturethroid on page 16, NP Thyroid on page 17, Westhroid and WP Thyroid on page 29. See here. Luckily, most prescription NDT brands are not that expensive anyway. Armour did go up, while the others stayed less expensive like NP Thyroid. Some use the prescription comparison called GOOD RX to find the best price in your city. 2) Medicare in the US states “….the serum TSH test is reliable, valid, and acceptable to patients.” To the contrary, patients of all ages have found it to be the most ridiculous test to either diagnose or treat by. It should always be about clear symptoms along with the free T3 and free T4, plus about where the latter fall in those so-called normal ranges. This is why you HAVE to be informed and be prepared to stand up for what is right and wrong. Read http://stopthethyroidmadness.com/tsh-why-its-useless There is also a complete chapter against the lousy TSH lab test in the STTM II book, and written by an MD! THAT is a chapter your doctor should read. Even worse, the ATA (American Thyroid Association) has stated that the target serum TSH should be 4-6 mIU/L in hypothyroid individuals age 70 or older. That is in spite of the fact that so many of us at ANY age can have raging hypothyroid symptoms even with a TSH in the 2’s. 3) Or take the British Thyroid Association (BTA), which has stated that British thyroid patients shouldn’t be put on any thyroid meds whatsoever until their TSH is over 10, and that seniors should have a TSH around 4-10…in spite of the FACT that no matter what age, we can have raging hypothyroid symptoms even with a TSH in the 2’s–symptoms which UK doctors may blame on something else!! Equally as bad, the UK National Health Service only endorses levothyroxine, and refuses to provide T3 to patients anymore. 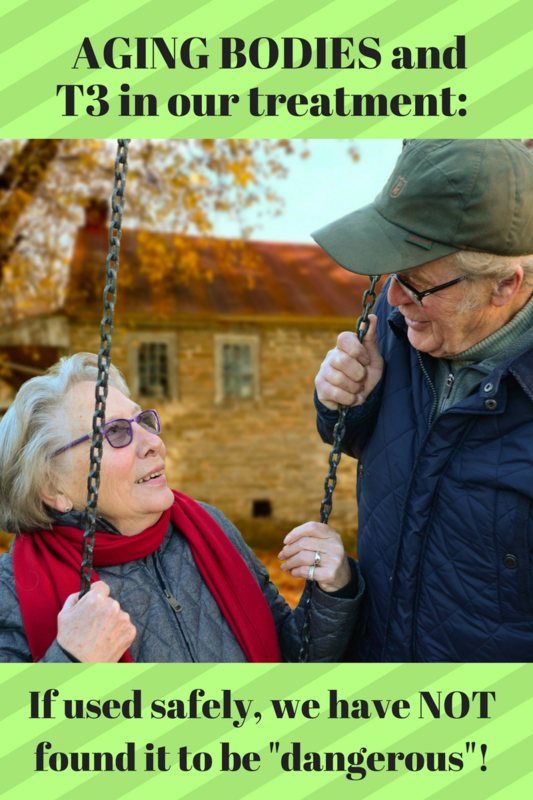 Commiserating with other seniors: If you are OVER 60…consider joining the Facebook FTPO 60-and-over discussion group and see where others have found a good doctor. (FTPO stands for For Thyroid Patients Only) https://www.facebook.com/groups/FTPO60andover/ NOTE: you canNOT be approved if the admins can’t discern that your age fits this group, or we can’t see either your wall posts or friends list–the latter to know you aren’t a spammer. If you have to go in the hospital…have an informed family member or friend) who will advocate for you about your current NDT or T3 treatment. Too many patients have reported they were taken OFF their needed T3 or NDT and put on T4-only…and they regret not bringing their own meds or having an advocate. Keep a document stating what thyroid meds you are on, and why, that your advocate can have access to. To get the STTM Books: http://laughinggrapepublishing.com …. because YOU have be informed!! If we put all our apples in a doctor’s cart, the risk is high we’ll stay sick or poorly treated. We have to be prepared to guide our doctors! Get help in changing whatever proof you can give for the admins to see. It’s only temporary and you can change it back. Anyone know how long a person has to be on adrenal cortex before they should test phasing it out? The 24 hr test showed the morning and midnight sample as low end of range. lane777, we don’t redo saliva while on any form of cortisol. Instead, we do Daily Average Temps to make sure we are on the right amount. Then we start correcting all the reasons we got adrenal issues in the first place, ranging from still being hypothyroid, to low iron, to inflammation, etc. Only when we have corrected all the reasons do we start a slow wean. Chapter 6 in the revised STTM book explains a lot, even if it mentions hydrocortisone instead of ACE. Both apply to that chapter. K good to know, thanks. Only switched from synthetic to NDT ten days ago and already my eye brows are growing back in and prob not even on upper limit yet. Unreal. I just realized that daily average temps being low could also be an indicator of inadequate NDT dosing, not just inadequate adrenal cortex. So how do you tell which one it is? The use of the three individual temps to find your daily averages are not to be used to ascertain your NDT dosing. They are simply to help you discern if you are on enough cortisol. Wow weird 50 mg isn’t enough to bring up my temp already. k just ordered the book, couldn’t wait until it got here to get some answers. Thanks for all your responses. I’m SO HAPPY to read this story and to learn from the “senior wisdom.” I too am a senior, age 67 with Hashimotos’ and adrenal fatigue (which by the way I have healed.). More often than not, I read the stories of the younger thyroid patient and while they are interesting it is just harder for me to relate to them. I have not yet encountered my Medicare not paying for my Nature Thyroid, but perhaps my secondary insurance has been paying and I did not make the distinction. in Thank you for this detailed article. After finally being diagnosed 5 years ago, my dr. has me on levothyroxine for my free t4 values and naturethroid for mainly my free t3 values. If one wants to go off levo and you are taking just naturethroid, how can you raise your free t4 without adding levo? So basically, how do i reach my optimal values on Naturethroid alone? Well, against popular opinion, I will share the love. I am seeing in some of my friends and family the same health struggles. Maybe, as they see me get well, they will soon visit your site, also. Many blessing and keep up the good work! Evelyn, Janie is right. It does take a lot of workon your part to get well. I know because I’m still learnng, still researching and reading. This page has really helped me cut the learning curve. Good luck in your journey to good health. You are in the right place – this place! I am 48, not sure that qualifies as baby boomer. but I wanted to share my story. I have not felt healthy my entire adult life. I suspect I have always had thyroid problems although the test until 2 years ago did not reflect so. I went in for a yearly and she felt my neck and said,” I am going to run a thyroid test”. When it came back she said it was in a “safe range”.Not “bad enough” to put me on meds. I immediately came home and started research. I have been on anxiety meds for 12 years and they are working for the most part, but I have all of the symptoms of being Iodine deficient(thyroid issues, anxiety, and candida). I recently found out that the anti-anxiety meds I am on, is made from fluoride. So, I am beginning to taper off ever so slowly now, to get off of them. I began almost a month ago supplementing with Lugol’s. I would like to share my experience…. I began with 2 drops a day 2 percent. Additionally I am and have been taking Zinc, Magnesium and Cod Liver oil. (for over a year, now) So,(I believe this is text book) I felt great the 1st day. lots of energy. Day 2, my hands busted out with tiny little fluid filled blisters. I had them before but just here and there. Itchy and painful they were. By day 4, they were gone and my hands were itchy and dry like I used bleach with out gloves. Day 6, I came down with a terrible cold and fever. So disgusting, what I blew from my nose. Terrible, Terrible, Terrible, headache with this cold!!!! I was sick for 14 days! So apparently, upon research, I found out I was detoxing or cleaning out and chelating the metals and other bugs I have. (I have amalgams in my teeth which, I just found out contains mercury, how did I not know that?) and I should have been taking Selenium, too. Must have missed that, some how. Apparently, that is the biggest help in detoxing as it helps bond the bad stuff and takes it out. I bought some raw Brazil Nuts because they are yummy and they contains the highest food source of Selenium. I eat 5 a day. Be careful, not to eat more than 7, it can be toxic if you get too much. So, I feel fabulous, so far my energy level has sky rocketed and I am getting mental clarity! I just upped my dose to 4 drops sublingual. I do the 5 days on 2 days off protocol. I use the weekend to help me remember. Just a side note another huge benefit… no more breast pain! I have had fibroid tumors in my breasts and they are GONE!!!!! I know I am suppose to continue detoxing until I reach proper iodine levels. From what I have read rashes, acne, and other pains are to be expected. I will take it slow, because that first round of detox was rough and I do not want to experience that again. Also, I am taking a teaspoon of baking soda in water each morning and sipping on lemon or lime water all day. Hooray. And what iodine does for the breasts is huge!! Congratulations! I have a question about the minerals I am taking. Do I take them everyday forever or once my Iodine levels are reached and I take it only as a supplement, will I reduce them at that time? Or, because I have amalgams will I continue using them all everyday until they are removed? I am still learning about natural health as I do not have insurance and do not trust most M.D.s, anyhow. Especially, because I have had to diagnose myself after all of these years! Thank you for your advice in advance and your dedication to promoting good health to all! Good question. Use me as an example. I appear to have some mutations that just may mean I need to be on certain supplements my entire life to a degree. For example, I have a mutation that keeps my folate 50% lower than it should be, and I may need some the rest of my life. I have another issue which may need biotin the rest of my life. Or with CoQ10—as we age, we may not be converting ubiquinone to ubiquinol as well as we used to, so I’ll stay on that. Etc. With others, they seem to be about getting my levels up to a good spot, then I can perhaps not need the supplement anymore and simply get nutrients from good food…but I will test down the line to make sure I stayed optimal. The way to know about things for me has been 1) doing 23andme.com then uploading to sites I mention on this page: http://stopthethyroidmadness.com/mthfr, 2) doing the Organics Acids Test, which told me a lot (and takes a lot of study on your part), 3) plus doing SpectraCell’s Micronutrient test. So with the minerals, it just might be about getting optimal, reducing or eliminating, then testing later to see if supplementation continues to be needed or not. You are amazing. It all makes sense. I will begin studying. Everyone thinks I am a wacko for doing this to myself. (especially, while I was detoxing) I am my only advocate, No one knows (around me) how badly I was feeling. I felt like I would likely die if I kept on the path I was on. I have lost a lot of respect for my medical drs., because they just kept treating the symptoms, not looking for the cause. It is sites like yours that are educating people like me. Thank you for all the people that you are healing or have healed. You know what, Evelyn? The VERY reason I started this patient-to-patient movement is because we were NOT getting well in the hands of our doctors. I stayed miserably sick for 20 years and was getting worse. So were others. So are others. Nor were we getting well due to “strong opinion”. We have only gotten well by being willing over the years to try certain strategies, and to report on it all to each other. That is what STTM is about—all those reports and the wisdom gained. So yes, let STTM educate you! It’s only by your education can you get well and demand what is needed for you. I took my firs NDT 3 days ago. but last night I kept waking up in surges of adrenaline. and yesterday I was having surges throughout the day. should I stop the med? Hi. Well, first of all, with RT3 that high, it’s mostly T3-only we get on. Second, a cortisol problem causes that adrenaline rush. Compare your results to this page, because it’s not about being in the normal range: http://stopthethyroidmadness.com/lab-values Then if you are lower more times than u realized, chapter 6 in the revised STTM book is your go-to chapter, which also applies to Adrenal Cortex aka ace. I have been on Synthroid since I was 20. and I am now 60. Hypothyroid gallops in my family. I see the info and I don’t even know where to get started. With my former medical doc my ideas were always just shut down. Patti,because it’s so important for you to be informed, consider getting the revised STTM book. It’s written in an easy to understand manner. http://laughinggrapepublishing.com Then you have knowledge to counter bring shut down. It’s important. I am stumpped…I have no idea what the labs should be. I have hashi’s and feel like crap. My body aches and I have all the other things…fatigue, cold sensitive, depression, dry skin etc. I am 62 and need to know what to telly doc. She prescribes NTD but doesn’t know about it. I recommended STTM but she is not interested.I need a new dr but need to refill my ndt soon. Hi Roberta. Start with the labs here: http://stopthethyroidmadness.com/recommended-labwork Then when you get them back, compare with this page, not those ridiculous “normal” ranges: http://stopthethyroidmadness.com/lab-values Also study this page and be firm with your doctor: http://stopthethyroidmadness.com/hashimotos Lots to read, but you DESERVE to have the RIGHT treatment, and we all have to be informed to demand it…. I am also that story above. I was on Synthroid only for 20+ years. Looking back over my life and things especially in my late teens/early twenties I had symptoms just had no idea what they were associated with. Fast forward to age 46 and thought it was just aging………not. When diagnosed my TSH was 54. Back then took doctors advice and until 3 years ago had to argue just to keep my dosage after having it cut in half in 2004 and taking over a year to get back to any kind of normal again. I have read everything I could get my hands on, researched and found many helpful groups these past 3 years and am certain that if I had not kept up on things and been persistent I would still be having issues. Today I can say I feel much much better than 3 years ago and am on T3 only at this point. This is such a happy story! Please share your doctor. It is so hard to find good ones that address thyroid, female hormones, cortisol….let alone thyroid. The good doctor list is okay but…. Thank you! Where do you live? I will be glad to share my doctors contact info if you live in Western Washington. In the mean time this might help. I am over 60, and have been hypothyroid for at least 9 years. I am on Medicaid due to financial constraints. Unfortunately, Medicaid doctors in my city/county are abysmally behind the times when it comes to diagnosing thyroid disease. In the past, I have had to order my T3 meds from a foreign pharmacy because my Dr. refused to prescribe. Unfortunately, the T3 meds I ordered don’t always arrive. To compound the difficulty, I live in a hot climate, so that my “window of opportunity” for ordering T3 is limited to November through March. After that, the heat during shipping destroys the efficacy of the T3. I only use the T3 if it actually arrives or is shipped! ( So much for foreign pharmacies!) So, I have hypo sympyoms most of the time because I can’t get the T3 when I need it. American medical practice, re thyroid disease, is still practicing 1950’s medicine in the 21st century! Jeanne, I agree, there are many doctors who are unwilling to step outside the AMA/Big Parma box. What it takes is a doctor who also has Hypothyroidism and Hashimoto’s and has found that synthroid – pushed by big pharma doesn’t work. Not only does it not work but over time it causes other issues. There is help here though. Thank you so much for sharing your journey! I’m so happy STTM was there for me too ~ I can totally relate! I am so overwhelmed when I read these stories. I had my thyroid remove 15 years ago. It’s a constant battle. Right now my levels are off so much, I am in a mental block. So tired cant see straight. Here every Doctor I try and talk to tell me these syptoms are not caused by my hypothyroidism. I go in on Tuesday for another blood draw to check if playing with my synthroid by taking 1 137 mcg one day and then half on the next 2 day then repeat. Typically I take 1, 137 mcg each day. ( this is per doctors request because my recent blood work was so off..)I am actually feeling pretty ill. I was told several years back about Armour, but even with a script I couldn’t get it. I am so tired of living in this haze. I dont even know what tests I should be requesting. I downloaded a lot of this info to show my doc 1st hand. Cholesterol is off the chart and at this point I am so hungry when I shouldn’t be. Even my heart rate is up and slightly uncomfortable. And the rashes and nails so soft just keep breaking off. Hair too. I am so frustrated. What do I ask to get the right help? I live in Mi. Sorry for the long comment / question but I am desperate for answers. They make me feel like I am going crazy but I know its the thyroid . How can they all be so ignorant. I too read on the site STTM. I am shocked at how so many people understand this info so much. I want so much to feel like the women I use to be..Thanks for sharing your story. I’m so sorry Becky! You sound like me before I switched from synthroid to an NDT. I would call the pharmacists in your area to see who prescribes and who supplies a Natural Desicated Thyroid Hormone. OK…..that is me in the above story and I am here to tell you that because of Janie, her book, and the admins on her FB page and one other, that I am alive today. If my story helps just one person get better then I am happy. It is payback time! When my body finally crashed, I spent a year waking up and then going back to bed on the couch. However, I used my smart phone to access the internet start learning while on my back! My sister, who no longer has a thyroid, told me about your FB page. I gotta admit that I drug my feet a bit as I did NOT want to take dried up pig. (What a silly thing!) Now, I am so glad I did. I have my life back! A word to the wise: It is not over once you start this journey. My body keeps changing. I have learned to listen to my body. I know how to adjust what particular supplements I need and when and what to do if I am accumulating too much rt3. I can tell even before I get my labs back. I am my own advocate now and I have the support of this page as well as another (who often posts links to STTM). Thank you Janie and thank you to all the admins who suffered through my questions when I was a newbie!